Being one of the best Multi Mill Manufacturers in India we aim at providing a wide variety of Multi Mills that are precisely engineered and manufactured by using superior quality raw materials. Our Multi Mills are in high demand on the global market as they are corrosion resistant, come equipped with flame proof motor & flame proof rotary switch as per clients requirement. The Multi Mill offered by us is made out of best quality stainless steel and contains four rollers which make the machine moveble as and when required. 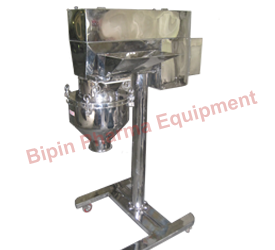 Multi Mills are used in multiple places and applications like pharmaceutical formulation, food products, creams and cosmetics which require multiple processing styles like grinding, extracting, emulsifying, dispersing, homogenizing and mixing. We, as Multi Mill manufacturer in India are aimed towards offering our clients with models that are upgradable and different sized at affordable prices. These are designed using high-grade raw material and modern machinery that are procured from genuine and authorized sellers in the industry. Multi Mill is extensively used for dry granulation, pulverizations, etc. in pharmaceuticals, chemicals, cosmetics, ceramics, colors, dyestuff, food products. Our Multi Mill Machine 3 HP is appreciated in markets across the globe as it is high-performance, accurately designed, meticulously crafted and corrosion resistant. &ast; Functions on the principle of variable force swing beaters which have both knife and impact edges which rotate within a selected screen to obtain the required size reduction. &ast; Material that is fed into the hopper goes down the processing chamber where it moves to the periphery and passes through the screen both radically and tangentially. &ast; Finally the processed material is collected in the container that is placed below the processing chamber. 25 to 100 Kgs. / Hr. 50 to 200 Kgs. / Hr. 400 to 500 Kgs. / Hr. 150 mm Approx. 250 mm Approx. 350 mm Approx.